This is a requirements of the Local Authority Building Control Department. You, the applicant, are required by law to ensure that an application is lodged for all building works that require a building warrant and they comply with the bulding regulations. Your consultant will physically deal with the application however the legal onus is on you to ensure this is done. The Building Warrant will deal with all technical matters concerning your extension. i.e drains, foundations, ventilation, structure, health and safety, insulation to name but a few. Your consultant will submit plans for scrutiny by an officer of the Local Authority Building Control Department who will make comments and discuss the project with your consultant. 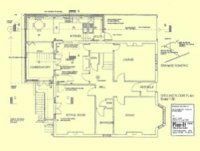 Once the officer is satisfied that all aspects of the building regulations have been satisfied they will issue a building warrant and stamped drawings for the project. These are legal documents which must be retained by you for future reference during any future sale of the property. This is a requirement of the Local Authority Planning Department and is quite separate from the Building Control Department. The planning permission considers issues of appearance, environmental concerns and neighbours. There will be a certain requirement for the extension to 'blend in' with the house and not to detract from the existing environment i.e substantial tree removal. Some matters of concern to your neighbours could include over shadowing or loss of view. These are dealt with through the planning department who again will scrutinise the plans and discuss any short comings with your consultant.